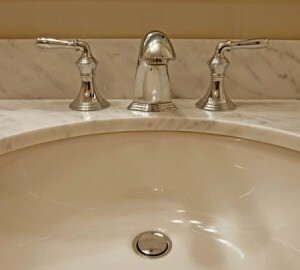 Porcelain sinks are common in bathrooms and older kitchens. With regular care and cleaning, they can look great for years. This is a guide about cleaning a porcelain sink. I have a alabaster porcelain sink. I really don't know what happened, but there is a white ring mark in the sink. I can't get it out. I'm thinking someone put a pan that was too hot in the sink. How can I remove this white ring? Have you tried baking soda?It should work, good luck. How do I keep my porcelain sink white without using bleach or harsh chemicals? Use Whiting, it is a super-fine powder for polishing glass items such a porcelain, mirrors, appliances, etc. It is available in good paint stores (used as a paint thickener). Wipe sink down with sudsy all-cotton terry cloth; sprinkle whiting and then wipe clean (polish is more like it). There's no law against waxing the sink or placing a rubber mat in bottom to protect against scratches or nicks from pans. I'm cleaning porcelain sinks that seem to have a touch of soap scum and what looks to be remnants of a sealant around the faucet. The stuff is so hard, I've been using a razor to carefully take off the stuff. Just wondering, when I take it off is the porcelain supposed to shine or am I taking off the protective layer? What is the best thing to clean a porcelain sink with? I use bleach on mine and it works beautifully. It takes out the stains and it looks like new, so I have to agree with Nicki with the use of bleach.